Anthropogenic Mummification is the most common form of mummification. It is the intentional act of preserving a body. Mummification of bodies was a natural process used in Egypt and other cultures, where the dryness of the sand or salts in which the body was buried, the heat or coldness of the climate, or the absence of air in the burial helped preserve the body. Sun, fire or other sources of heat were sometimes used to dehydrate the bodies, as well as using smoke to cure the body. Also, materials such as grass could be used to surround the body, fill its cavities or seal the burial place so that, by the exclusion of air, decomposition and further deterioration was prevented. These processes have produced mummies not only in Egypt, but in South America, Mexico, the Alps, Central Asia, the Canary Islands, Northwestern Europe, the Aleutian Islands and Alaska. 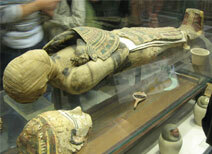 Spontaneous Mummification occurs when a body is mummified due to natural causes. 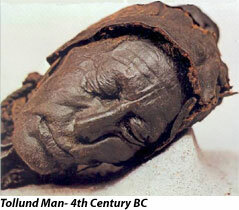 An example of spontaneous mummification is the 1950’s discovery of the Tollund Man who was buried in a peat bog in Europe. The natural acid of the bog along with other natural elements caused the body to become mummified. 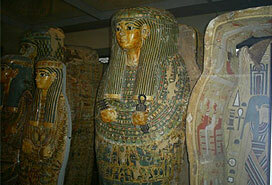 In ancient Egypt, mummification was considered integral to one's afterlife. The mummified body provided a place for a person's ka, ba, or spirit, to return to the body after death. After the death of an Egyptian, the embalmers would bring the body to the ibu, “the pure place”. In this workshop, the body would go through a process that lasted seventy days. The body was purified by washing it with natron water. According to tomb depictions the deceased is shown standing as if alive on a pedestal or in a basin while a number of priests pour the liquid over him. This cleaning ritual was the first step in the process. It is thought to have represented the rebirth of the deceased. After being washed and cleansed, the body was taken to the wabet, the “palace of embalming.” This next step began with the evisceration of the body. All internal organs were removed- except the heart. The heart had to remain in place, it would testify for the deceased person in the afterlife. Often a scarab or other amulet would be placed over the heart to protect it in its voyage through the netherworld. The brain was usually removed. A long, slightly hooked tool was introduced into the brain through the nose, swirled around to liquefy the brain. The head was then tipped forward and all contents of the skull poured out, again through the nose. It was also not uncommon, that the brain was left in place. It simply dried up and shrank during mummification. The next step was to desiccate the body. The body was laid out on its back. At times the empty thorax and abdomen were filled with little linen packages containing natron. The entire body was covered with finely ground natron salts, salts native to the area, and not unlike today's baking powder. Over a period of approximately 40 days, the salt absorbed all the moisture, the flesh shrank, and the skin darkened. 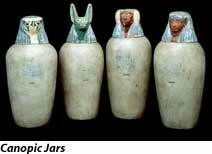 The lungs, stomach, intestines, and liver were dried out and each placed in a canopic jar. The jars came in sets of four, and each of the Four Sons of Horus were assigned the duty of protecting the contents of one of the vessels. After being dried in the bed of natron salt, the body was then washed and all traces of the salt removed. 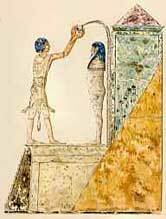 The body is then taken to per nefer, “the house of beauty,” where it was filled and shaped back to its normal size. Many perfumes and oils were rubbed on the body and the open wounds were filled and covered with wax, or in the case of the pharaohs, gold was used. After the anointing was completed, molten resin was added to cover the body. Both men and women would be colored with ochre. The men would be colored red and the women yellow. The body was then ready to be wrapped. The wrapping process lasted approximately fifteen days. Most commonly, fine linen was used for the wrapping. Head, neck, the individual fingers and toes were wrapped first. The digits were sometimes covered in gold leaf tubes. Then followed the swathing of arms and legs and the torso. During wrapping amulets were inserted, the most important among which was a heart scarab placed over the heart. The amulet was there to protect it, but also to prevent it from betraying sins the deceased had committed to the gods sitting in judgment. With royal mummies the arms were often placed across the chest, with ordinary mortals they were tied together, the hands covering the genital area. Finally the whole body was wrapped with linen strips soaked in resin, joining the arms to the body and tying the legs together. The wrapping was at times shaped to recreate facial features. Sometimes it was also painted, or inscribed with magical formulae. The mummy may be wrapped with further shrouds, covered with a mask, which in the case of the pharaohs was made of gold with inlays of precious stones, while others had gilded or just painted cartonnage masks. The mummy may have been encased in more than one wooden anthropoid coffin and was finally lowered into a stone sarcophagus with a heavy stone lid.